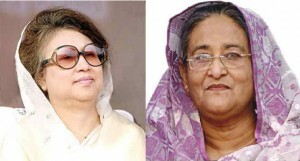 Opposition leader Khaled Zia (left) and Prime Minister Sheikh Hasina (right) have been alternating as prime minister since 1996. Visiting the Shahid Minar, the memorial to students killed in 1952 protesting against Urdu as the sole language of Pakistan. Now Feb. 21 is a major celebration of the Bangla language. have been able to make a dent in the situation. The two parties and their women leaders hate each other. Neither side will back down on the unrest that started with the Jan 5 anniversary of the election. While more and more people are defying the blockade, after 2 months people have to make a living, the risk is too high to take a bus load of undergraduate students around the country. 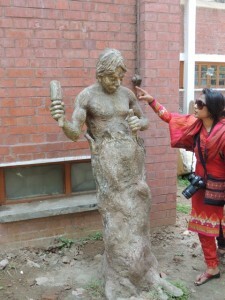 One of the sculptures we saw at the Art Institute in Bangladesh near the National Museum and Shahbag Square. only to find a 4-hour delay on our flight. The airline nicely rebooted us for the next connection to Dhaka and escorted us through the airport to catch it. However 4 bags missed the connection. By the time we got to our hotel it was midnight and we still hadn’t had dinner. It was two AM by the time we go to bed. My TA, Matt, had to go back to the airport in the morning with Sukhen, but only 3 of the bags arrived. The missing one was Matt’s, but having lived in Dhaka, he had clothes in storage there. The rest of us went to Dhaka University to meet our Bangladeshi counterparts, 8 students and 2 professors that are traveling with us. After a quick tour of a few spots around Dhaka, we headed to meet the Kokilmoni. I have sailed on her twice before. With Plan B, we will have to skip some areas, like the Brahmaputra River, that we cannot get to by boat in our limited time. However, we will get more time at other spots of interest and see what will be new parts of the country for me from a different vantage point. We started on a the Shitalakhya River east of Dhaka and sailed south in larger rivers finally passing the confluence of the Padma (combined Ganges and Brahmaputra) with the Meghna River before tying up at Chandpur for the night. 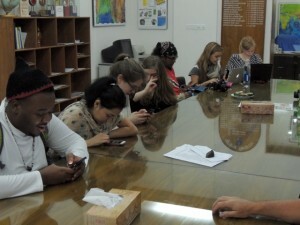 The students catch up on texts and e-mails at Dhaka University after two days without a connection. A boat is a much more pleasant way to travel than a bus with more places to hang out and rest from jet lag. The food is good and plentiful. The cabins are tiny and hot, while the showers are cold. 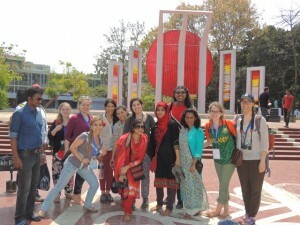 The main thing the students missed is any opportunity to buy Bangladeshi clothes. Along the way we made two quick stops, one above and one below the confluence, for Liz to take samples for OSL analysis, a dating technique that uses electrons trapping in quartz to determine the last time the sediments were exposed to sunlight. The samples, collected by hammering a tube into the outcrop, must not be exposed to sunlight. Otherwise, these first days are quiet as it will take us until tomorrow afternoon to reach our first extended field stop. Boats are a comfortable, but slow way to travel. 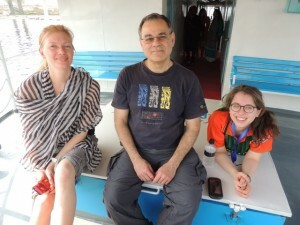 Sitting on deck between Liz Chamberlain and Miriam Kaplan as we sail across Bangladesh. Liz Chamberlain of Tulane University takes samples for OSL analysis from the bank of the Meghna River. Students board the launch that will ferry us to the Kokilmoni. The M/V Kokilmoni, our home for the next 8 days. 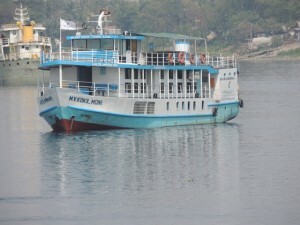 This tourist boat for the Sundarbans Mangrove Forest came all the way to Dhaka to pick us up. the same subjects as yours and I feel wee could greatly benefit from each other.